Posture..... Whats good, bad and better? For most of us out there posture is a problem! The problem is more on the side of not knowing what good posture looks and feels like. Yes, our bad posture is a problem too but if there's a problem without a remedy I'd say that's a bigger issue in itself! The image on the left, correct posture, has relatively no curves on the surface but has plenty of curve in the spine. For those suffering from low back pain (leading cause of missed work annually) this is for you, more so than anybody else! So what does good posture look like? 1. There should be no real curve to the spine as you look side on. When observing your posture from the side there should be no apparent curve of the spine. The closer to straight up and down the better off you are. Some may say this is incorrect, I disagree. What they may not take into consideration is your not looking at a fair representation of the spine in this position. Between the skin and the muscle overlying the spine, you're not actually looking at the spine in this position. The skin and muscle give a false sense of positioning, especially in the lumbar spine where you can have a considerable amount of paraspinal musculature skewing the perceived position. With proper muscle balance the shoulder lay flat against the ribs. 2. The shoulders should be drawn down the back, not pinched together. When this is achieved the shoulder blades hug the rib cage without flaring or winging away from the ribs. 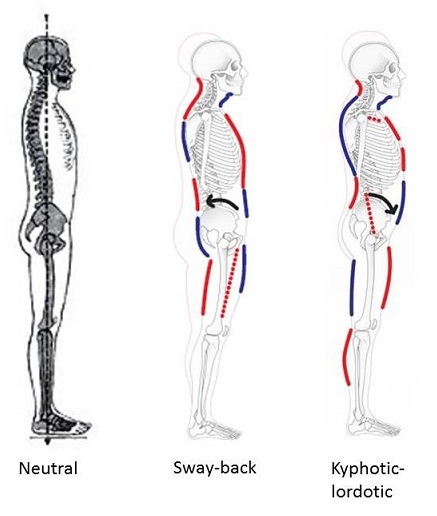 Many of us, due to lifestyle, tend to have our shoulders elevated, drawn forward or even pulled back together thinking this is how we are supposed to stand with good posture. In reality, drawing the shoulder down the back is much more appropriate for good posture. Anteversion is anterior and retroversion is posterior tilting. 3. The pelvis should be tucked up under the chest. The recent obsession with big behinds has resulted in folks, mostly women, rotating their pelvis anteriorly in an effort to make it look bigger. Anatomically speaking the pelvis should be directly below the shoulders. This allows for proper balance between the trunk flexors and extensors of the trunk, resulting in better posture. The anterior rotation of the pelvis results in excessive pressure on the posterior elements of the spine. In a way, you are pinching the vertebra together. Look familiar? Most everybody has this problem in varying degrees. 4. The ears should be over the shoulders. Due to our flexion lifestyle (driving, texting, computer use etc.) over time we develop a jaw jut that pushes the head in front of the shoulders contributing to terrible posture. This "jaw jut" is the physical manifestation of imbalance between the cervical flexors and extensors. Over time this posture can result in loss of cervical curve and neurological symptoms like Carpal Tunnel syndrome. 5. Balance from front to back. On a Macro-level, the point of all this is muscle balance from front to back and side to side. Without balance, joint positioning will be off resulting in premature wear of the articular surfaces, anybody in their 30's with unexplained arthritis knows what I'm talking about.